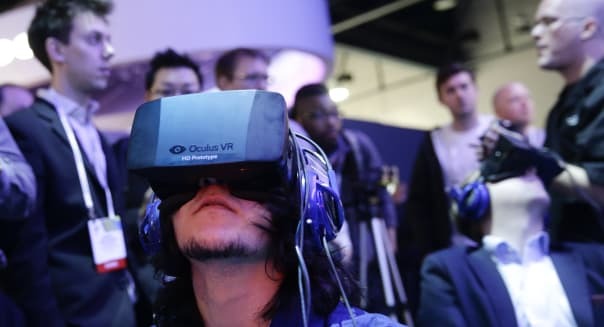 Jae C. Hong/APVideo gaming with Oculus Rift virtual reality headsets were a notable feature of the 2014 Consumer Electronics Show in Las Vegas. The news-making 2015 edition is this week. From an agrochemicals giant checking in with fresh financials to the year's biggest expo for the consumer electronics industry, here are some of the things that will help shape the week that lies ahead on Wall Street. Is the country ready for an unlimited multiplex subscription plan? AMC Theatres (AMC) is teaming up with Movie Pass to offer access to daily screenings starting at $35 a month. The test begins on Monday in the metro Denver and Boston markets. The only limitation is that subscribers can't repeat a movie. It's a big gamble on AMC's part. The perceived value of a night at the movies could take a hit. However, with theater attendance on a gradual slide since peaking a dozen years ago, it's hard to blame AMC for trying something radical. Entertainment has become something that thrives with a subscription plan, given the popularity of digital buffets of movies, music, and books. It's time for old media to learn some new-media tricks. The annual International Consumer Electronics Show -- or CES, for short -- kicks off on Tuesday in Las Vegas. The four-day event is a huge deal, with more than 150,000 expected to attend, taking in the latest gadgetry from 3,500 exhibitors. A lot of industry announcements are made during the expo, and some of the tech news will move stocks. Will 2015 be the year of the smart home? Will 3-D printing finally take off at the consumer level? Is this the year that wearable computing hits its stride? A lot of companies will have plenty to say during CES. Monsanto (MON) steps up with freshly harvested financials on Wednesday morning. The agricultural chemicals giant isn't at its best. Analysts see revenue slipping 11 percent, and those same pros see an even larger dip in profitability. Monsanto has become one of the more controversial companies as activists rally against genetically modified organisms, or GMOs. Defenders of Monsanto argue that genetically modified seeds that provide more bountiful harvests have helped eat into world hunger. There's a fair chance that you stand on one of these two sides in this hot debate. Toss out the name "Monsanto" the next time a conversation gets boring, and things will liven up quickly. One of the more surprising losers of 2014 in the realm of retailers is The Container Store (TCS). The haven of housewares and closet organization systems struggled this past year, and the stock has surrendered more than half of its value. It's easy to see why a stock that initially popped after going public in late 2013 is in a funk. Sales growth has decelerated, and the only reason that the retailer's top line is growing at all is because it's opening new stores. Comparable-store sales have fallen in the first two quarters of its current fiscal year. We'll see if it can snap that streak on Thursday when it reports results for its fiscal third quarter. The first complete trading week of 2015 will end with Acuity Brands (AYI) announcing quarterly results. Acuity is a major provider of lighting solutions, ringing up roughly $2 billion in annual sales across several brands. Acuity's also growing a lot faster than you might expect for a lighting specialist. Analysts see year-over-year growth on the top and bottom lines in the double digits coming in Friday morning's report. Now that is illuminating. Motley Fool contributor Rick Munarriz has no position in any stocks mentioned. The Motley Fool recommends and owns shares of The Container Store Group. Try any of our Foolish newsletter services free for 30 days. Is your portfolio ready for the new year? Check out The Motley Fool's free report for one great stock to buy for 2015 and beyond.